Each year the Sedgwick Museum endeavours to offer one work experience programme for a period of two weeks for one school age student. Each student spends time with a number of staff members and experiences a variety of the different aspects involved in working in a Museum. By offering this as an opportunity we hope to inspire a new generation of Earth Scientists. In August 2015 I was privileged to complete two weeks work experience with the Sedgwick Museum which for me was a dream come true. 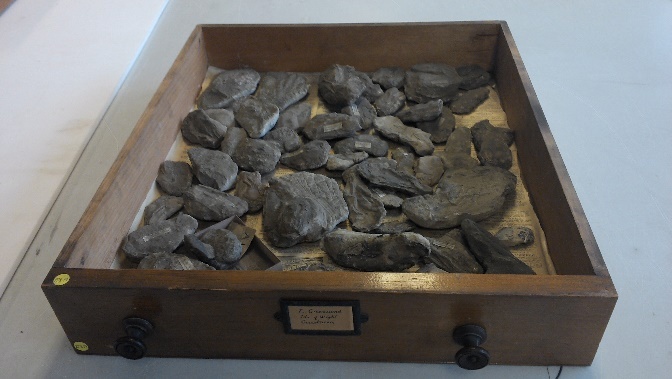 Since the age of seven, I have been a regular visitor to the museum and have taken up geology as an A level and go fossil collecting regularly. For the first two days I assisted Matt (Collections Assistant, Palaeontology) with his work, which involved taking an inventory of all the specimens on display in the Pleistocene section of the museum. I got to handle some of the objects and understood that the collection is so vast that not every item is catalogued and if they are catalogued they do not necessarily follow the same system. The scale of this operation became even more apparent when he showed me the software used to index information of every item in the collection which was simply mind boggling. On Wednesday I was with Rob (Collections Assistant, Documentation and Display) working on a different inventory for the drawers and cabinets that are usually locked. 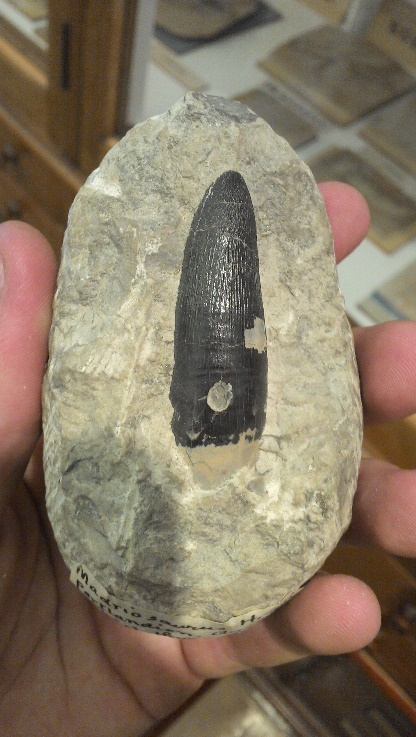 I had a lot of fun looking through dozens of drawers of trilobites and later making the surprise discovery of a two inch long tooth in a drawer from the Jurassic section! (figure 1). Further investigation enabled me to identify that it belonged to a nine metre long crocodilyform, the largest of its type in the Jurassic. The exhilarating buzz you feel when something like that happens is something I won’t easily forget. From Friday onwards I was in the Brighton building which is the centre for conservation as well as storing even more material, working primarily with Sarah (Conservator) and several volunteers. I began by digitising an inventory taken of the Hume mineral collection so that it could be made more readily available. I also met Simon, a researcher from CASP (Cambridge Arctic Shelf Programme) who kindly showed me what he was working on and donated some material to me to work on. 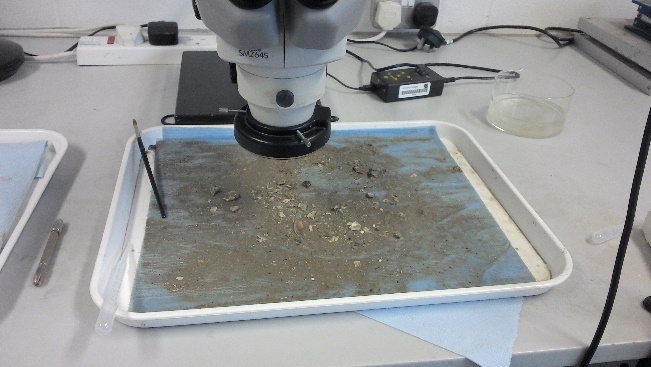 This material consisted of a washing-up bowl full of dry clay which I saturated and placed under a high power binocular microscope to search for any small fossils left in the matrix (figure 2a). 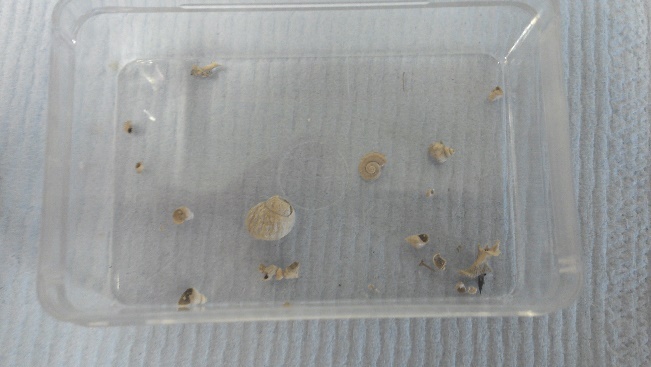 I had reasonable success with this recovering several small gastropods and a possible fish bone (figure 2b). Figures 2a and 2b. To give an idea of scale the width of the largest gastropod in figure 2b is approximately 5mm. By Tuesday of the second week I had progressed to cleaning fossils. I was assigned a drawer of cretaceous crustaceans (try saying that five times fast!) from the stores, which as a result of the coal generators the museum used to use for power were covered in coal dust (figure 3a). 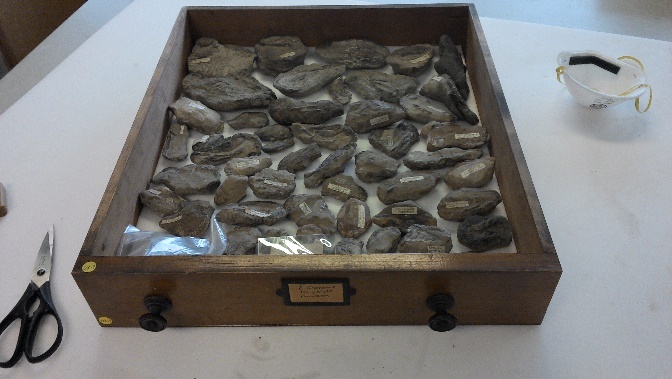 Firstly I cleaned each specimen with a soft brush and a small air pump, then I cleaned the drawer and lined it with barrier film and plastazote inert foam to prevent any further damage to the fossils from acids in the woodwork. Finally the specimens were repacked in a way such that they would not rub against each other (figure 3b). Figures 3a and 3b. Crustacean drawer before and after cleaning. Come Wednesday I was at work with Dan (Collections Manager) with a laser scanner. He explained to me that it is becoming increasingly important that this fantastic collection can still be accessed even though some of the objects are too significant to risk handling. 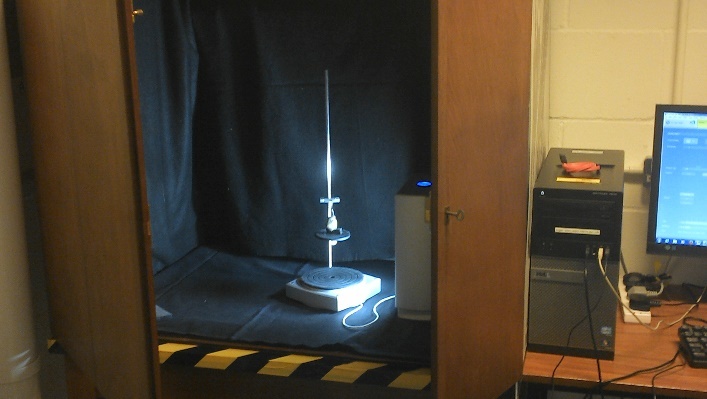 We chose a small brachiopod to scan into the computer, beginning by placing it on a rotating stand (Figure 4a), setting the distances then taking two 360 degree scans, each with the fossil in a different orientation to capture all the detail. 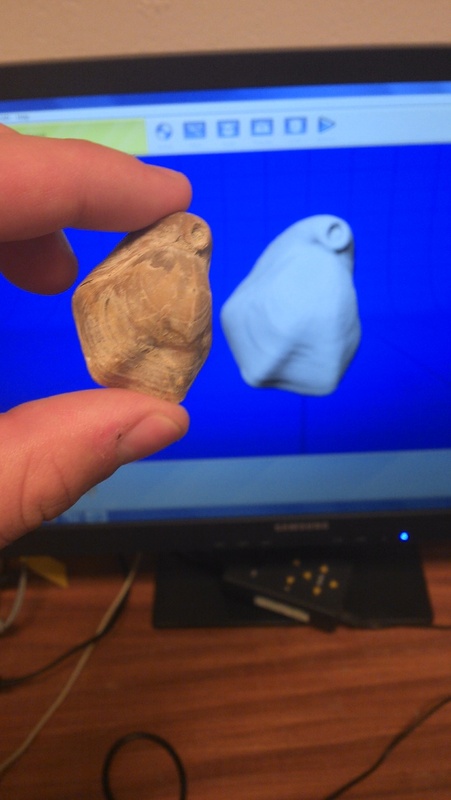 We then trimmed out the unwanted bits and aligned the two scans together to create one complete scan that just needed some more trimming and fusing together to create a digitised model of the brachiopod (figure 4b). Thursday was spent partly cleaning more specimens, shark teeth this time. This presented its own problems as they’re so well preserved they’re still sharp and scrape the enamel off each other as they rattle around in trays when the drawers are opened. I solved this by cutting slits in the plastazote to hold them in place and protect the cutting surface. In the afternoon I helped Sandra (Archivist) in the archives. All the material in this archive relates to particular objects or the museum’s history, so it’s as important, if not more, that these are conserved too. After instruction on how to handle the documents safely I set to work on bundles of documents created during the organisation of an expedition to Spitsbergen (also known as Svalbard) in 1965. I found this extremely interesting as going on an expedition like this is something I really want to do. My tasks involved repacking the documents in acid free folders, checking for damage and removing any rusty paperclips or staples. I continued this the following morning but for my final afternoon Dan and I tried to 3D print the brachiopod we scanned earlier in the week. Firstly we filled every hole in the computer model and orientated it so that as little of it was horizontal as possible because the machine creates a weird pattern on these surfaces. Next the computer generated support structures around the model so that it wouldn’t topple over whilst printing and could lie flat then it was ready to print which took about two hours. The end result was remarkably similar to the original fossil (Figure 5), but it did need a bit of smoothing with a scalpel. Figure 5. 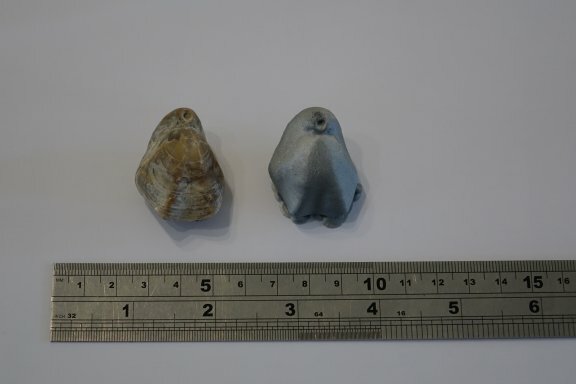 On the left the original brachiopod and on the right the 3D printed copy. The plastic is based on lactose so is completely biodegradable. I was unhappy to leave as all the staff I met were so welcoming and it was a great change to be able to discuss fossils and palaeontology with people who share that interest. Above all else it has confirmed to me that this is what I want to do in my future without a shadow of a doubt. Many thanks to all the staff and volunteers at the Department for making this such a memorable experience.